Shared Belief working toward comeback. I sure hope we see a race from him before the end of the year. I really think he has immense talent. But his trainer, Jerry Hollendorfer, has one of the worse records when it comes to violations. How much is it Shared Belief and how much is it Jerry's drugs? 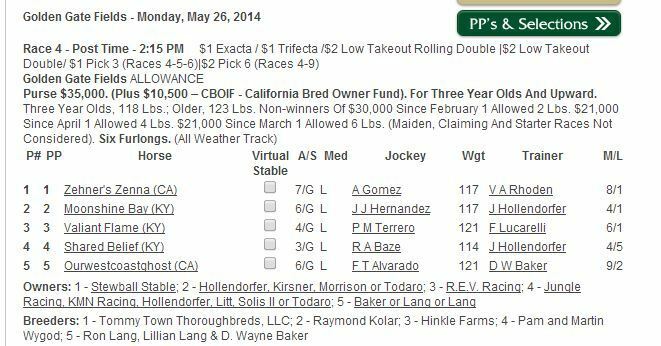 Has anyone heard anything about a return to racing this Monday, May 26? Yes, he is entered in race 4 at Golden Gate in an open allowance race on Monday. If he comes back as good as ever he could be a serious rival for CC. It wouldn't hurt horse racing to have an Affirmed and Alydar or Sunday Silence and Easy Goer like rivalry. How would you like to have your horse going up against Shared Belief when SB is carrying the low weight of the field at 114lbs? Ah! I didn't realize it was for 3 year-olds and upward. The field is made up of all geldings. The oldest is a 7 year old. I know this field doesn't compare to any current field of top class stakes-caliber 3 year-olds, but Shared Belief might be the first of his stakes crop to face older horses. Shared Belief's race is in 21 minutes! its race 4 at Golden Gate. if you have a Calracing.com account (Free to sign up) you can watchi it there. thats where im watching it.